As your mobility decreases, there may come a time when you need to have a StairLift fitted in your home to help you negotiate the stairs. A StairLift is a device that literally lifts you up the stairs. It takes the form of a seat that is fitted to the stairs, which has the ability to transport you up or down the stairs at the push of a button. For people with disabilities or chronic mobility problems, this allows them to get upstairs when it was previously difficult or even impossible for them to do so unaided. Many people injure themselves trying to climb the stairs on their own, with thousands of these requiring hospital treatment as a result. Having a StairLift fitted in your home can go a long way towards preventing these types of accidents in the home. StairLifts can be folded away when they are not in use, so family members who don't need to use it can easily access the stairs. Can a StairLift be Fitted to all Stairs? You don't necessarily need to have a straight staircase to have a StairLift fitted. 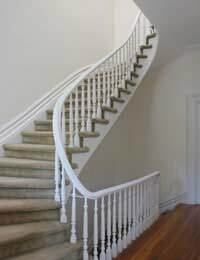 They can also be fitted to curved staircases, although this is usually more expensive due to the more intricate nature of the job. In most cases, the StairLift company will want to come to your house before the StairLift is fitted so that they can get a good idea of what is needed. Most types of stairs can adequately support a StairLift. Although most stairs can accommodate a StairLift, the type that you should choose depends on size and shape of the stairs. Your physical needs should also be taken into account. If you struggle with movement in your hands, you may want to opt for a StairLift with joystick or toggle controls, as they can be easier to manoeuvre than those that are controlled by buttons. Most StairLift companies will be able to advise you on the type of StairLift that is best suited to your individual circumstances. StairLifts are fitted to the tread of the stairs, so you don't need to worry about your interior design! It will usually take no more than a few hours. Most StairLifts are operated by electricity, which makes them useless in the event of a power cut. Battery powered StairLifts are available though. These automatically charge themselves when they get to the top or bottom of the stairs, so you don't need to worry about recharging them. Some StairLift companies have a 24-hour phone line for emergencies that you can call to request a call out for one of their engineers. If this isn't the case, you'll probably have to contact them during office hours on weekdays to request a call out, which may involve waiting several days. Look for a StairLift company that specifically offers a round-the-clock call out phone line, if possible, as being without a fully functioning StairLift is inconvenient if it means that you're unable to get upstairs or downstairs in the meantime.